Happy 2011 and January!! I returned to Boston last week from a 10 day excursion to visit family and now entering full-on baby prep mode. Started hypnobirthing class last week and have lots more workshops and reading to finish. I sure hope that you all had a cheerful beginning to this bright new year ahead and are motivated to keep up with your yoga practice! First things first, my teaching schedule. So, some of you may have noticed that I am not on the Karma schedule this month to be teaching my noon MWF classes. Well, honestly it was a shock to me as well. I had all intentions to be teaching them still this month. Turns out there was a snafu in communication with management and it was thought that I was to begin maternity leave already. I was just as surprised as some of you last week to see the new schedule and find that out as I had initially planned to come in and teach. With some new teachers already on the schedule and in place, it's going to remain that way. I am sad to prematurely be leaving all of you, but sometimes the cards work out in that way and you just go with it, and it might be for the best. So, keep me updated on your practice and if I can point you in new directions. I would love to continue to be of service. I WILL however, continue my prenatal class on Wednesdays at 4:00pm. 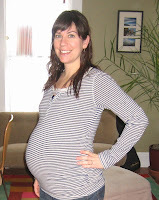 So, those of you with little ones in your belly, I hope to keep seeing you then. :) And maybe I'll run into some of the rest of you around the studio then, too. And, I'm teaming up with Steph (Naz) Zabel to lead a Prenatal Yoga/Reiki Workshop on Saturday, Jan. 29th at 5:00pm at Bow Street Yoga. Everything with my pregnancy is going along just fine. I am in my 32nd week with an ever-growing belly and lots of movement on the inside. I will hopefully have another update later in the month, with new picture included. I have tons to do as far as organizing the house and haven't even started the baby room/gathering accessories yet! My pose of the month: Yoga Squat -- Malasana. Join me in practicing this pose daily if you'd like. Maybe the energy from all of you will continue helping me prepare my body for it's natural production of this baby boy to come. **Last week's New Moon was in Capricorn and was also a partial solar eclipse. Make sure to take a moment this week whether in yoga class or for 2 minutes at home to sit in quiet and honor an intention within. Try choosing just one word that might sum up your goals for this year and know that change can no longer be avoided with your positive outlook on the future. My word is transcendence. I am aiming to go beyond a prior state of myself this year to find that spirit inside that is not afraid of anything. Birthing a human will require this, and then caring for that human...all while maintaining a sense of self that remains in balance with my surroundings and relationships. So, cheers to you all in this lovely new year. We'll be in touch!